Step 1 Wash the turkey inside and out, pat it dry and weigh it. Measure 1 tablespoon of kosher salt or the appropriate amount of a seasoned salt into a bowl for every 5 pounds the turkey weighs (for a 15-pound turkey, you'll need 3 tablespoons of kosher salt). Step 2 Sprinkle the inside of the turkey lightly with salt. Salt the outside, concentrating the salt where the meat is the thickest -- on the breasts and thighs. It should look liberally seasoned but not oversalted. Step 3Place the turkey in a 2 1/2 -gallon sealable plastic bag, press out the air and seal tightly. If you can't find a large plastic bag, use a small garbage bag. Place the turkey in the refrigerator. Chill for 3 days, leaving it in the bag but turning it and massaging the salt into the skin every day. Step 4Remove the turkey from the bag. There should be no salt visible on the surface, and the skin should be moist but not wet. Wipe the turkey dry with a paper towel, place it breast-side up on a plate and refrigerate uncovered for at least 8 hours. Step 5On the day it is to be cooked, remove the turkey from the refrigerator and leave it at room temperature at least 1 hour. Be sure the drumsticks and wingtips are secured to the body to prevent scorching. Step 6Place the wood chips in a pan and cover with water. Start the fire: Light the charcoal in a chimney and place a bread loaf pan in the center of the coal area of the grill's firebox (fill the loaf pan with ash to prevent flare-ups). When the coals are well lighted, distribute them evenly on either side of the loaf pan and let them burn until they are coated with ash. Step 7Drain the wood chips and put them on top of the charcoal. Place the grill on top of the firebox. Step 8Lightly brush the turkey with oil, then place it on top of the grill, centered in line with the loaf pan. Cover. Step 9After 30 minutes, check the fire. If the coals are starting to die down, add another half-dozen on both sides to maintain an even, slow heat. If you use an oven thermometer, it should read in the 300- to 325-degree range. Step 1 0Cook, adding more coals as necessary, until a thermometer inserted in the deepest part of the thigh, but not touching the bone, reads 165 degrees, about 2 to 2 1/2 hours total grilling. 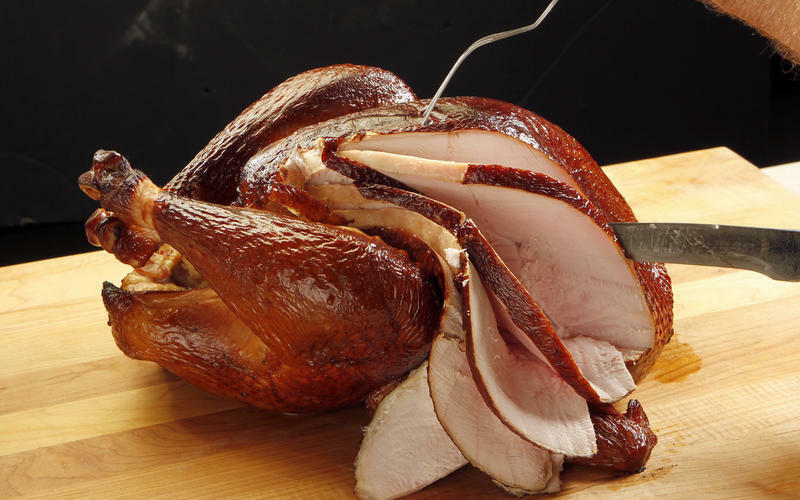 Step 1 1Remove the turkey from the grill, transfer it to a warm platter or carving board and tent loosely with foil. Let stand at least 30 minutes to let the juices redistribute through the meat. Carve and serve. Step 1 2Orange-pepper salt: In a spice or coffee grinder, grind 2 teaspoons orange zest (about 2 oranges), one-half teaspoon whole cumin, 2 teaspoons whole black pepper, 4 whole cloves and 6 whole allspice to a fine powder. Add one-quarter cup kosher salt and grind again to distribute evenly. In Recipes-list.com we have selected the most viewed recipes from category - Grilled Main courses . Enjoy the best recipes specially selected for you! Barbecued turkey is the right choice that will satisfy all your claims.